Simple yet elegant. Celebrate a special moment in your life with this beautiful 1/3 carat diamond channel set eternity ring, crafted in shining 9ct white gold. Elegant diamond jewellery, designed to sparkle at every opportunity. 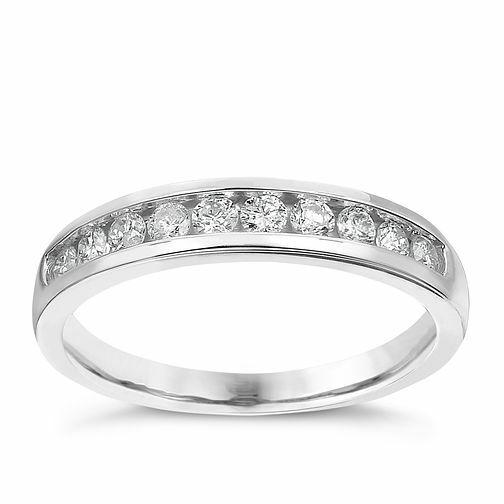 9ct white gold 1/3ct diamond channel set eternity ring is rated 4.2 out of 5 by 5. Rated 5 out of 5 by Anonymous from Great price, great purchase, outstanding company! I bought this as my wedding band as I was looking for something a bit more sparkly and my engagement ring is from this store too! In-store everyone was so friendly and helpful and nobody was pushy. When I ordered online it was a quick and easy process and it arrived quickly. The packaging was great and I’m very happy with my purchase! Looks exactly as it doesn’t online! Rated 1 out of 5 by Anonymous from Not impressed We bought this ring as my wedding band in July 2017 and I didn’t start wearing it until our wedding in October 2017 and at first this was an outstanding ring for the price, then only a few months later the ring and diamonds went dull, went back to the shop and explained and they said it needed redipping this was done in July 18 and again we are now in September and again the colour has dulled. I have had cheaper white gold rings in the past which are still sparkling now without being redipped.